Platinum selling country star and 604 Records recording artist Dallas Smith is pleased to announce the 2017 “Side Effects Tour”, presented by Old Camp Whiskey. 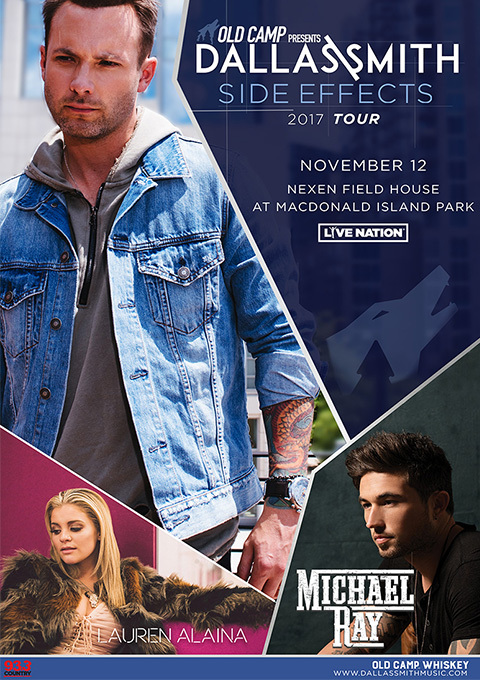 Kicking off in Halifax on October 12th and making stops in 26 cities across the country before wrapping in Abbotsford on November 18th, the national tour will see special guests Lauren Alaina, James Barker Band, Cold Creek County, Michael Ray and The Cadillac Three join Smith for select dates. The “Side Effects Tour” announcement comes on the heels of Smith’s fourth #1 single at Canadian country radio with “Sky Stays This Blue”, a first for a Canadian male country artist. Appealing to audiences far beyond the boundaries with sonic layers and a stadium sized voice, Smith not only celebrates his fourth #1 single at Country radio in Canada, but becomes the first Canadian artist in both the Nielsen BDS and Mediabase era to have three consecutive #1 singles and the first Canadian country artist to have three #1 singles from the same album (Side Effects). Smith’s top-selling album “Side Effects” - released one year ago and produced by studio ace and long-time collaborator Joey Moi (Florida Georgia Line) - features 12 tracks, including the albums first #1 single “Autograph” (the only #1 track from a Canadian Country artist in 2016) and the #1 hit “Side Effects”. The album showcases Smith’s incredible artistry and confirms he’s in his own lane – earning critical acclaim, commercial success and one of the most talked about journeys in Canadian country music. Flourishing on the edge of global superstardom, Smith lit up the stage during the 2017 JUNO Awards national broadcast in Ottawa earlier this year, delivering unparalleled vocals from one of the best voices in country music and the most explosive performance of the night. The ‘Side Effects’ of Smith’s performance included a 19% increase in streams of the single as well as 137% increase in sales of the track according to Nielsen. Currently nominated for four Canadian Country Music Association Awards including Male Artist of the Year, Single of the Year, Album of the Year and the Apple Music Fans’ Choice Award, Smith will take the stage for what will surely be another memorable performance when the CCMA Awards show hits Saskatoon on September 10th.